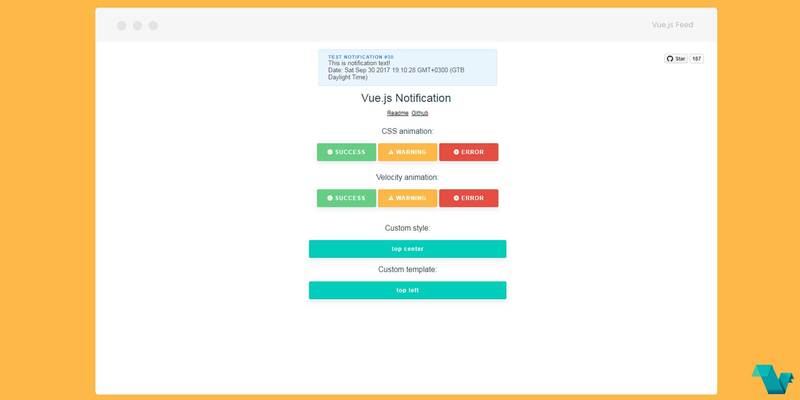 Vue.js notifications is a small library to add notifications with CSS & Velocity animations. The example below is making use of different kinds of notifications separated in groups. To start working with Vue.js Notification, use the following command to install it. The above example has a single notification. If you would like to use more, you can create groups for different uses. Two different groups with different positions and props. max: Maximum number of notifications that can be shown in notification holder and more available here. To activate the groups you can set up different methods with different types, texts, durations & speeds, like for system messages and actions for example. The plugin can use the Velocity library to make js-powered animations. To start using it you will have to manually install velocity-animate & supply the library to vue-notification plugin. If you are interested in more or you have any bugs and suggestions, click [here](https://github.com/euvl/vue-notification. That's it!